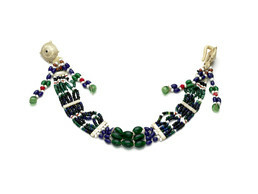 Women wore beaded jewelry during ceremonies and dances, including earrings that were connected under the chin by strands of beads. Nunivak Islanders were known for the exceptional artistry of their clothing, jewelry, and carvings. John Phillip, Sr.: Waten-wa tua Nunivaarmiut qarlingqerturalalriit. Joan Hamilton: Nunivaarmuit-qaa taugaam? Wangkuta-mi? Neva Rivers: Hooper Bay-mi carrarmeng uggun. John Phillip, Sr.: Ukatmun aturyarauluni wii tangllemni wani-wa. Joan Hamilton: Russian-armiuneng-qaa makut piluki? Virginia Minock: Taukut tamaa-i qumilget. Neva Rivers: Qumilget [beads with something inside them]. Red outside and white inside. Joan Hamilton: There’s some beads with the different colors on the inside. Joan Hamilton: Maybe this [front of earring hook] has, you know the design, the way it is, has some kind or significance. (2) The shape is the same as those other earrings, so, it’s not by accident. Joan Hamilton: Have you heard anything about that shape? Ann Fienup-Riordan: Sometimes they call it “eye of awareness.” Some of them do. Joan Hamilton: Niiteqallruten ellam iinganeng? Neva Rivers: Tangvaaratuniluta-wa camun pitullrukaitkut. Joan Hamilton: Uum qukani cangqerta? Joan Hamilton: Qamna un’a tungulria. Qaill ellillruat-ggu qamavet? John Phillips, Sr.: Ukiqaarluku engelqaqsagutaqaata ellia. Yuurraarluku elliqalarait tamakut. 1. Iqatat—plural of iqataq—”separators” are “pieces strung between beads on necklaces” (Fienup-Riordan 2005). 2. An as’un is an “earring hook that goes through the ear” (Fienup-Riordan 2005).